Governments are ideally designed to safeguard the interests of it's constituents. 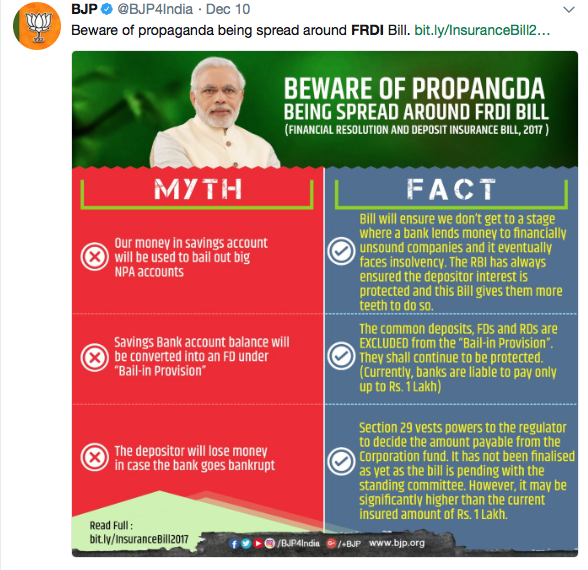 The FRDI Bill says it does the same but can that be trusted or is this another case of governments safeguarding their own interests? The tricky part in the bill is the "bail-in" provision that allows agencies to override the rights of the shareholders of the firm, which basically means that banks could be using depositor assets to stay afloat without their consent! But not everyone agrees, especially the All India Bank Employees Association who have threatned to go on strike if the bill is not ammended. Fix this now! / Meh..govt. knows best. 2017 has been an exciting year for Digital currency and Tech. Bitcoin is all the rage. Its gotten big enough for Google to assign it currency status. But even Coinbase agrees that people need to chill about it for a goddamn second. Cryptocurrency is producing history’s greatest army of self funded full time twitter posters with the backdrop of bitcoin price crossing the $17,000 mark! The Income Tax Department has caught whiff of this amazing hike and is now cracking down on Bitcoin exchanges throughout the country! Post-mortem reports on this crypto bubble are being carried out already. Is this a sinking ship? Honestly, what do you think? Honestly, we don’t care. We are stepping into a vaster realm. Blockchain has multiple implications and will only prosper as and when we realize what to build on it. There’s a huge opportunity, especially in India, to solve the problem of financial inclusion using blockchain tech — here’s a piece on how it can create measurable impact amongst the impoverished. Blockchain is the talk of the hour at Investopad. We have been hosting a lot of interesting meetups on blockchain, machine learning and other emerging technologies, to help the community to build on them. Blockchained India's session on Blockchain implementations, was on of these endeavours. Check out our events page to stay tuned into all this blockchain buzz. You know how our brains segment information on the basis of what's important or not and then forgets the irrelevant stuff? That's called selective memory. Machine models are learning to do the same, based on human neurotic memory synapses. Speaking of selective memory, the term "leisure" hardly configures in our productivity fetishising lives today. We forget that history is proof that the spark for a lot of technological breakthroughs originated in leisure. Remember to take breathers and productivity will follow! We have recently launched a Community Portal that'll let our coworkers interact online. So if you work out of our studios and haven't joined yet, get to it! Pingpad is a Slack ChatBot that functions out of our Gurgaon Studios. Here's our profile on them - taking a look at their recent innovations. Come hang at the Investopad studios to experience our variety packed calendar this month! Tech to Enviroment, we've got it all covered. Thank you for reading. Here's a cute lizard for your patience!